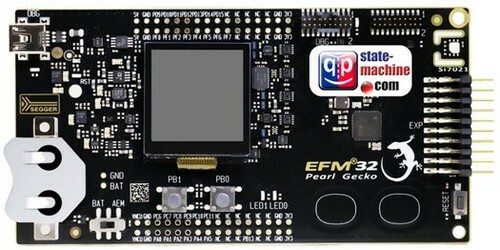 This example implements the Dining Philosophers Problem sample application on the EFM32-SLSTK3401A board (ARM Cortex-M4F). Once programmed into the board, the example rapidly toggles the LED1 from the idle loop (LED1 glows) and toggles LED0 as the Philosophers change their state. Additionally, you can depress and hold the BTN0 button (left) to PAUSE the application (Table transitions into the "paused" state). Releasing the BTN0 button causes transition back to the "serving" state.